The party bus Tampa Bay service that we offer can help one turn their holiday into a dream world. The Tampa Bay with the exciting beaches and long rides can be turned into one exciting trip with a day trip taken on one of the 20 passenger party buses that we offer. Book your party bus rental now: 813-514-6980! The party bus rental Tampa Bay service that we offer is a reputed shuttle service in the area. We also offer other rides, but the premier limo buses are most useful when you are traveling in a large group. It will get everyone together and the luxury amenities that we offer like kitchenette, music system, video recorders, television sets, bars and lounge seating will ensure that everyone has a good time on board. 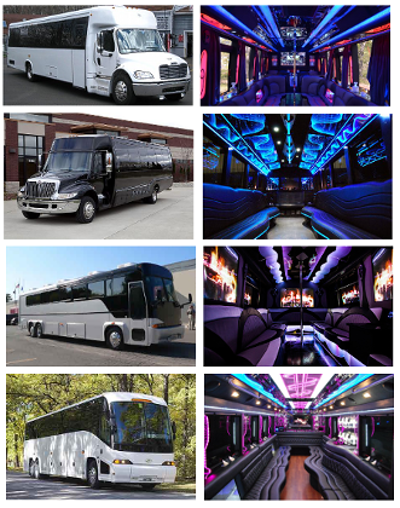 The process of booking a party bus rental service is easily done on our portal. All you need to do is figure out the party bus model you wish to hire. There are about 30 passenger party buses for hire and more. Hence, if you are traveling with a large group, you might want to hire more than one limo bus from our website. The limo bus models are different and the hiring rates differ accordingly. Once you have decided on the bus model that you wish to hire, the terms and conditions need to be agreed upon. The hiring terms are mentioned on the party bus Tampa Bay site. One can also call in at the call center numbers to gain assistance. Serengeti Night Safari; this is a fun tour to do in this region in the night. Yuengling Brewery; the brewery in this region is famous and offers a tour event. Tampa Bay History Center; it is a museum which offers a historical tour of the place. International Plaza; this place located on Bay street is the best address to shop at. Raymond James Stadium; you can catch games at this arena. There is party bus rental Tampa Bay service for shuttle rides to and from the Tampa International airport. The limo bus rides are convenient and luxurious when large groups of people need to be transferred to the nearby airport on time. There are several people who are traveling to and from neighboring cities and towns around Tampa Bay like Safety Harbor, Mango, Tampa, Brandon, Largo, Citrus Park, Seminole, Bloomingdale, Gulfport and Pinellas Park Temple Terrace. In order to make the long road journeys comfortable for a group of people, it is best to opt for one of the 50 passenger party buses that we offer. It will help one to get the group to their destination in comfort and luxury.